Is a well-known and popular sportsman. For some years Master of the East Essex Foxhounds. He is a keen yachtsman, and as owner of the magnificent auxiliary steam yacht Sunrise, 345 tons, devoted much time to cruising. 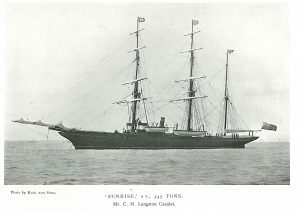 He purchased Sunrise from Lord Ashburton in 1887, and at once embarked on a very lengthy cruise, extending over twelve months. During his absence on this cruise lie was elected a member of the Royal Yacht Squadron. After this he made a two years’ cruise to Asia Minor, where he had unrivalled sport, especially with woodcock, having killed in the two seasons close on 2,000, besides a great variety of other game, including pig and two large leopards. He was one of the founders, and for years was Honorary Secre­tary, of the Seaview Yacht Club. In 1889, the outbreak of the South African War, Mr. Coope took his s.y. Sunrise to Durban, and placed her at the disposal of the authorities for use as a hospital ship. The offer was gratefully accepted, and the Sunrise was used as a tender to the hospital ships Lismore Castle and Trojan, as well as a hospital ship for officers, in which capacity her services were of extreme value to the convalescent.